Whether you’re talking about tenders, production estimates or administrative processes, the important thing is to find the most cost-effective solutions that meet the specified requirements. Bidcon helps you do this and much more, offering real support as you work on estimating. Our large databases are being progressively expanded to cover all aspects of construction. Security levels as well as User levels that are customizable. We offer open training at several locations or completely customized training for your company to you as quickly as possible to get the benefit of Bidcon. Bidcon English Standard – consists of estimation explorer, reference books (price book library), spreadsheets and summary sheets. 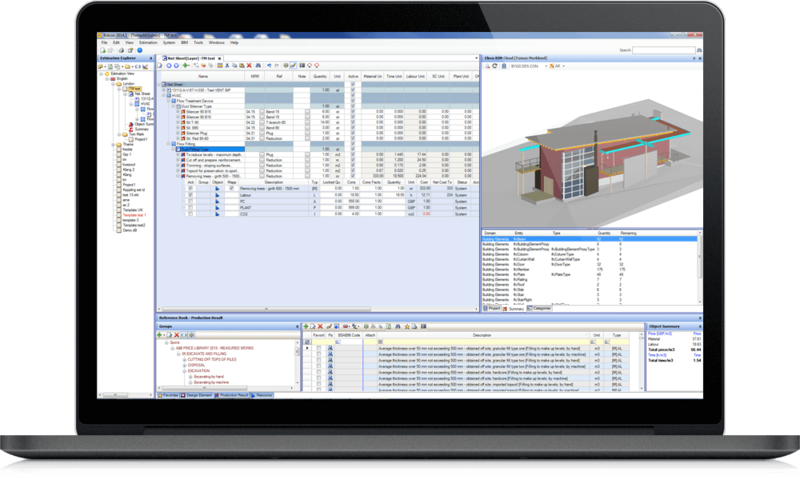 Import and Export, Price requests, importing BOQ with structures and BIM functionality as well as predefined and customizable reports/printouts is available. 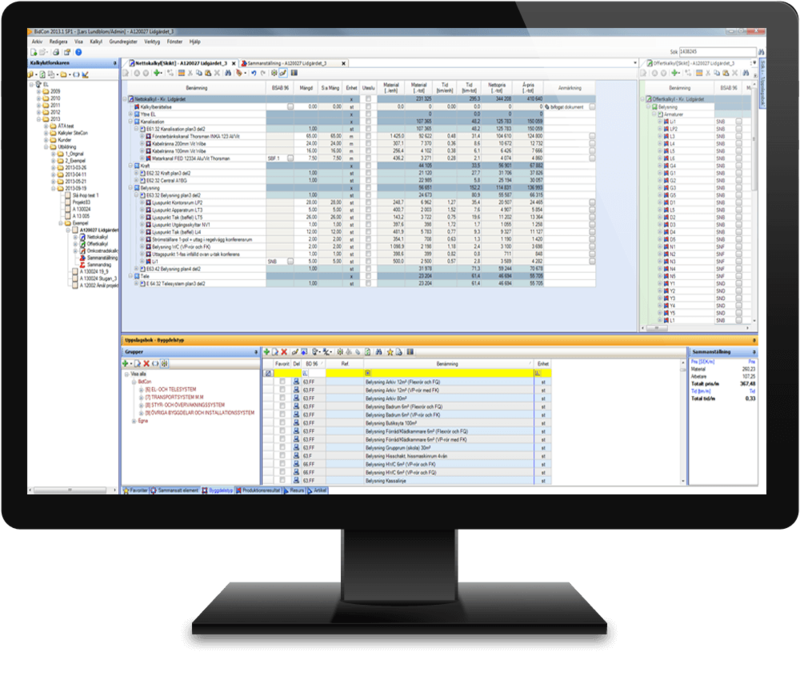 Global search and filter, Codes for production or structure and Accounts/material grouping can be used to simplify all stages of estimating. Security levels with user management of groups and/or individual customizable rights/settings for both program and estimations. More advanced features like Production Phase and Travel Solution, Multi Estimation, Locations and Cost Control is currently only available in Sweden. Reference books are different libraries of Mixed Elements (ME), Design Element (DE), Production Results (PR), Resources (RES) and Articles from Vendor Pricelists. These dictionaries contain predefined recipes that can be easily adjusted in the estimation. The pane Favorites is the users own shortcuts to ME, DE, PR, RES and Vendors pricelists and can be organized, with own structure, to achieve quick and easy access. Design Element (DE) is complexed recipes or functions, consisting of one or more production results (PR). Production Results (PR) is Basic recipe or activity consisting of different types of Resources such as Labour, Material or Subcontractor with time consumption and costs. Resource (RES) is the basic elements in the estimation. Resources can be of different types such as Plant/machines (P), materials (M), Labour (L), Subcontractors (SC), Officers/officials (O), Information (I), tendered Subcontractor [SC], tendered materials [M] and Adjustment (J). An Article is a specific product that can be linked to a material resource, this pane also contains imported Vendor Price Lists, discount letters and supplier information is accessed. In the Estimation explorer there are both current and previously saved estimations. Depending on the configuration of BidCon, the function is different. Estimations saved in the database, which we recommend, will always be opened in the Explorer where you can see or hide all estimations, closed or opened. File-based estimations will only be shown in the explorer if they are opened. All postings are placed in an Estimation Sheet. Most postings that a project should contain are entered into the Net Sheet. Postings related to expenses regarding the project can be entered in a separate Tender Sheet. Expenses (such as production costs) can be entered in the Expense Sheet, often used as template. Object Summary is a sheet where all active entries are summarized and can be adjusted regarding the various resources/articles prices etc. In the Summary transferred values / ratios from the estimations sheets can be added more information (calculations, key figures) to retrieve a tender sum. Use predefined or customize with Excel.